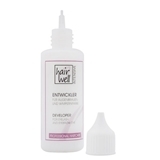 Instruction: Mix hairwell eyebrow and eyelash colour with a few drops of hairwell Spezial Lotion developer. Apply and leave to react for 5 to 10 minutes, wash aff well. Contains phenylenediamine. Product can cause allergic reactions. Wear suitable gloves..